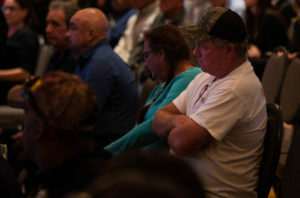 Dozens of oystermen and coastal residents spoke out at a public hearing Thursday night, arguing that the state shouldn’t grant an oil and gas company a permit to dredge wetlands around a drilling site near Port Sulfur. But they can’t stop Hilcorp Energy Co. of Houston from dredging. The company already cut the channel back in January 2016, when it moved a barge to a drilling site. In the Belle Chasse Auditorium, members of the Louisiana Oystermen Association and their lawyers urged the Department of Natural Resources not to grant the permit to a “serial law-breaker,” as a lawyer for the association put it. A spokesman for Hilcorp did not respond to a request for comment Friday. In late January 2016, Plaquemines Parish fisherman Gleason Alexis recorded video of Hilcorp vessels using a technique called “prop-washing” to move a drilling rig barge through his family’s oyster lease at Lake Washington, about 10 miles southwest of Port Sulfur. “Prop-washing” is a blunt method of moving a barge through shallow water. Tugboats push and pull the barge forward, forcing it to plow through the muddy bottom.